Suna completed her middle and high school education at TED Foundation Ankara College Private School. She graduated from Middle East Technical University Psychology Department in 1983 and received her Bachelor of Science degreee. 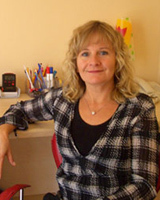 She completed her master's degree in Guidance and Counselling Department of Hacettepe University in 1986. In 1986, she was awarded "The British Council Postgraduate Scholarship" and worked as a psychologist in different special schools for autistic children in London UK. During this program she was a member of a team and she worked with children diagnosed as Autism, PDD-NOS, ADHD, Severe Learning Disability, Severe Dvelopmental Delay, Children suffering from Emotional Problems and other disabilities. Suna returned to Turkey in 1988 and worked as a research assisstant in Middle East Technical University, Guidance and Counselling department. Then in 1989 she joined the interdisciplinary team of Child Psychiatry Department of Ankara University and worked with children and families who have different problems like autism, developmental delay, eating-sleep problems,school problems, learning and attention problems, emotional problems etc. She had training in family therapy, play therapy, early intervention. She worked as a psychologist in The Center of Assessment and Treatment of Autistic Children in Ankara University which was the first official center in Turkey. In 1996 . she moved to Istanbul and worked as a leader of Psychological Assessment team of TOHUM FOUNDATION which is a nonprofit foundation for the assessment and treatment of autistic children in Turkey. In 2004 she established GÜNIŞIĞI Child Center with Çiğdem Ergül. She completed her training in family therapy in 2002 from the team of Israil Nord Cope Community Stress Prevention Center in Istanbul and she is working as a family therapist since then. Since 2009, she implements DIR/Floortime approach in her sessions, especially when working with children and families with autistic spectrum disorders.